Tata Motors has also introduced the much-appreciated NEXON with HyprDrive Self-Shift Gears, the AMT version of the vehicle. The Nexon in Sri Lanka will be available in six variants (XE, XM, XT, XZ, XZ+, XZA+) and six colours (Etna Orange, Vermont Red, Moroccan Blue, Seattle Silver, Glasgow Grey, and Calgary White). It will be for sale in 15 outlets across Colombo. Launched at a price of Rs. 1.99 Mn for Petrol and Rs. 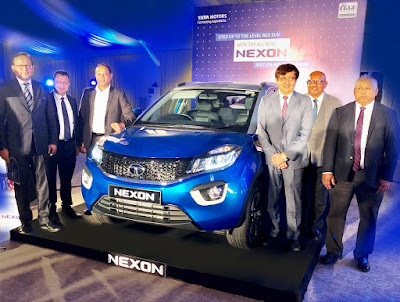 4.6 Mn for Diesel (Permit Holder Prices) for the XZA+ (Top Variant), the Tata Nexon is one of the most loved vehicles from the Company’s passenger vehicle stable. Setting a new benchmark in safety, the Nexon recently bagged a 4-star adult safety rating by the Global New Car Assessment Programme (Global NCAP), the highest adult safety score (13.56/17.00) amongst all the models tested by Global NCAP in India.